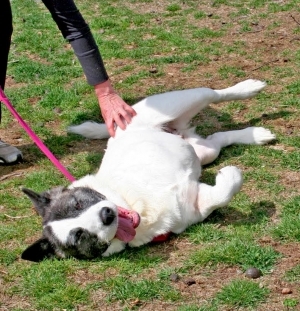 Misty is an Akita who came to the Shelter with a badly mangled front leg. Although no one really knows how the injury occurred, the extent of the injury was so extensive that the leg had to be amputated. Misty recovered quickly from her surgery and has adjusted quite well to the loss of her front leg. Unfortunately, her owner, who ultimately surrendered Misty to the shelter, had not kept Misty up to date on her rabies vaccination and, as a result, Misty had to be held in the quarantine unit for six months. During her medical exam it was discovered that Misty was pregnant. Ultimately, Misty had a C-Section and delivered six healthy puppies. 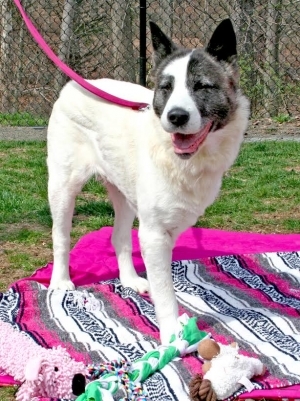 Misty and her puppies have thrived under the shelter's dedicated care and all of Misty’s puppies have been placed in forever homes thanks to the efforts of Big East Akita and S.O.S Akita Rescue. Misty’s quarantine will be lifted in the beginning of May, and she will then be ready to meet her forever family. Misty would make a wonderful companion in a home where she’s the only pet. She is currently at the Newtown, Connecticut Animal Shelter. For additional information about adopting Misty please contact the Brian J. Silverlieb Animal Care and Control Center at 203-426-6900.